This dog's nose has a healthy sheen. Dog owners who’ve been rudely awakened by the cold, wet kiss of their pooch’s nose are all too familiar with its texture. It’s a defining characteristic of the canine we know and love. Extremely sensitive, your dog's nose is approximately two million times better at smelling than yours -- in part because of this moisture. Your pet’s nose is wet due to a layer of mucus that naturally lies at the entrance of his nostrils. This mucus catches scents and enables your dog to better detect the odors in the scent. Moisture also comes from the tear ducts, which run into the nasal cavity. This moisture eventually finds its way to the entrance to the nostril, where it absorbs irritants, such as pollen. 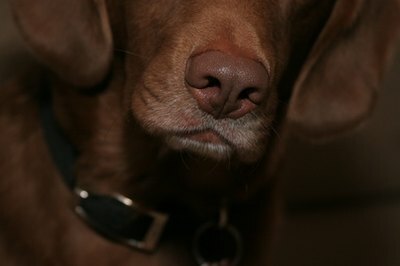 The nose is naturally cooler than the rest of your dog's body because it is moist and not covered in fur. A healthy dog will have a temperature of between 101 and 102.5 degrees Fahrenheit. If your dog’s nose is hotter than this, he may have a fever. The moistness and smooth texture of the nose make it feel cooler than it actually is. A dry nose isn’t always a sign of illness. Air conditioning, weather and the dog’s recent activity can call cause his nose to dry out. However, your dog’s nose is less capable of detecting scents when his nose is dry. A persistently dry nose, especially when accompanied by sneezing, gagging or inflammation, indicates a health issue, such as infection, foreign bodies or trauma. Always consult your vet if symptoms persist. His nose is supposed to be moist, but not running or dripping. A persistent nasal discharge can signify infection, tumors or simply the presence of an irritant. You can help look after your dog’s most prized asset by taking a few simple precautions around the house. For example, don’t leave potential irritants, such as strongly scented flowers, grass piles or household chemicals, within your dog's reach, especially if he's inquisitive, or “nosey.” Similarly, safely discard potentially hazardous materials, such as broken glass, string and sharp objects. Don’t leave them in the household trash, especially if your dog likes to poke his head inside the can for a sniff. Dispose of them outside in a covered trash can -- and if necessary, place a heavy object on top. Purina: Does It Matter if My Dog's Nose Is Wet or Dry? Telegraph: Is your Dog's Nose Cold and Wet?